The world we live in is tough on skin. 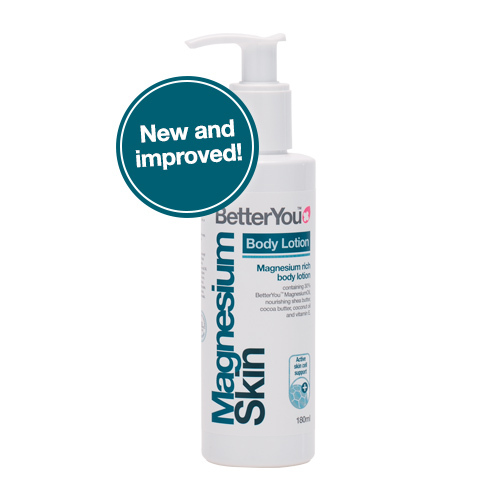 That’s why they use BetterYou™ MagnesiumOil as the main ingredient in MagnesiumSkin Body Lotion. A powerful mineral, it is key in helping repair and replenish cells, improving elasticity and overall skin health. Which means your skin is ready for whatever the day has in store. Aqua (Water), Magnesium Chloride, Caprylic/Capric Triglyceride, Glycerin, Isononyl Isononanoate, Butyrospermum Parkii (Shea) Butter, Glyceryl Stearate, Cetearyl Alcohol, PEG-100 Stearate, Cocos Nucifera (Coconut) Oil, Glyceryl Stearate SE, Benzyl Alcohol, Sodium Benzoate, Parfum (Fragrance), Xanthan Gum, Tocopherol, Dehydroacetic Acid, Citric Acid, Butylphenyl Methylpropional, Benzyl Salicylate, Coumarin, Linalool, Alpha-Isomethyl Ionone, Hexyl Cinnamal, Limonene, Hydroxycitronellal, Vanilla Planifolia Fruit Extract. Use daily to replenish magnesium levels and help improve skin elasticity. Gently massage Magnesium Body Lotion into clean, dry skin. For use all over the body. For the best results, use after having a bath or shower. 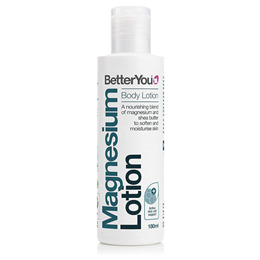 Below are reviews of BetterYou Magnesium Body Lotion - 180ml by bodykind customers. If you have tried this product we'd love to hear what you think so please leave a review. Really like this lotion and a great way to get more magnesium in. Unlike the previous reviewer I found it to be less thick than some creams and it spreads over the skin easily. It absorbs well and is very moisturising without being greasy. I also like how it makes my skin sting briefly - a sign that it really does contain magnesium. The only thing I'm not so keen on is the scent which to me is a kind of baby powder smell - a more interesting scent would have been nice. This body lotion is quite thick more like a cream and takes a while to rub in, also I don't normally have sensitive skin but when I use it for about 5 mins after rubbing in I have a prickly stinging sensation on my skin. The body lotion is far easier to use than the body butter.